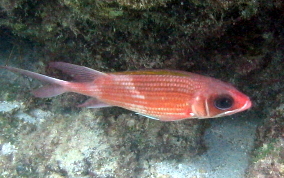 Although this fish is called the "Common" Squirrelfish, in my experience, it seems to be less common than the Longspine Squirrelfish. 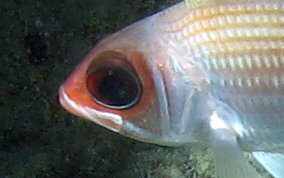 This common squirrelfish's dorsal spines do not have any white "triangles" at the tips. The Longspine does. 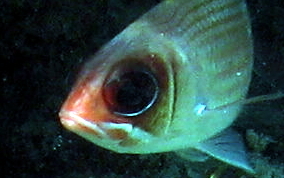 They also have both a front and rear dorsal fin. 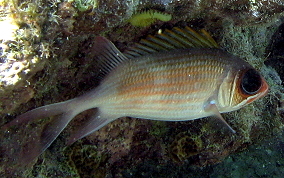 The rear dorsal is usually erect and the front one is laid back. 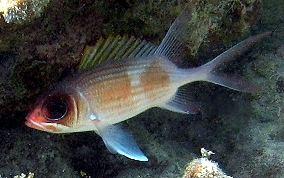 The common Squirrelfish is the largest of the family ,sometimes growing to be a foot long. In she shallow bays you'll find the intermediate sized at about 6-8 inches. They often have mid-body white patches and can be very pale to very orange in color. 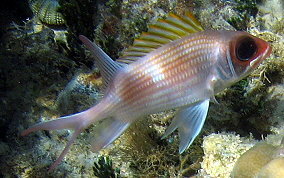 You'll find them resting during the day near openings and overhangs with other species of squirrelfish. Their scale pattern reminds me of corn on the cob.